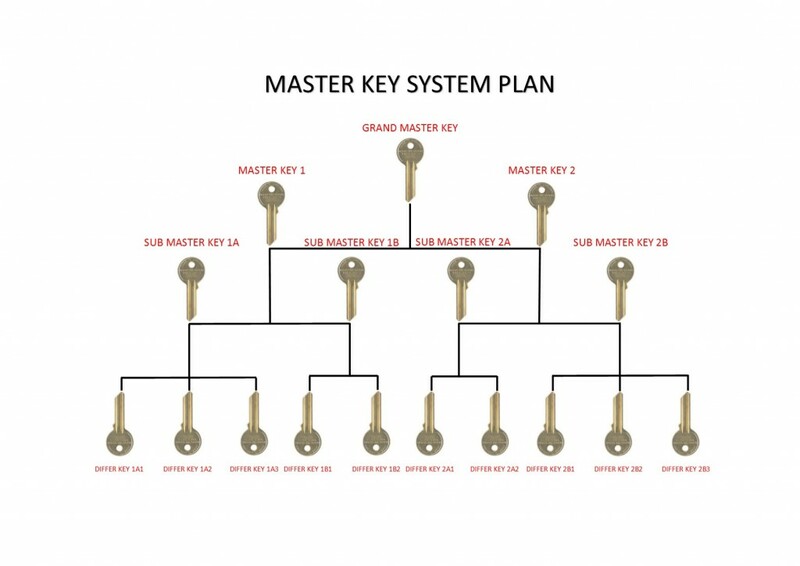 Plain and simple, a master system allows you to have different levels of access to each lock and to be controlled by one key (Grand Master). A master system uses standard pinning technics plus goes one step further and uses “master wafers” or “spacers” in each chamber. These wafers create an additional shear line that allows the master key to turn in all of the locks. This way, you can have different pinning combinations for different levels, but the extra shear line(s) can allow a number of different keys to work the lock. You will always have a master and sub-master, but depending on how you want your system set up you may/may not have a grand or great grand master. To understand what these levels are, let’s look at an example. Let’s start with a basic system – a Master and Sub-Master. Say your business has four main locks: the front door, goods in door, office door, and merchandise case. You want your manager to open all of the doors, your supervisor to open the front door, goods in door, and merchandise case, and you’re other employees to only open the merchandise case. You will need a master key system with two sub-masters under it. The master key would go to the manager, one sub-master would go to your supervisor, and the other sub-master would go to other employees. Now let’s add in a Grand Master key. Your District Manager currently carries a key ring the size of a bowling ball and would love to lighten his load. Well, you are about to make his day. You can give him a Grand Master key that will open every door in all shops in his region. Get excited – it’s time for the granddaddy of them all – the Great Grand Master. While your DM had a massive key ring, think about the size of the box it would take to contain keys to all of your stores. If (and that’s a big if) you wanted a key to open all of your stores, you could cut a great grand master key. Typically, these keys are owned by an officer of the company and are kept under tight lock and key. Many key system sellers (including us) don’t recommend ever cutting these keys. Have a different setup in mind? No problem – the beauty of master key systems is that they are very flexible and can be set up however you need.